Van Heusen - The Premium Brand of choice for Corporate Business/ Work-wear for Men and Women, now offers another exciting new product - the VAN HEUSEN E-Gift Card. With its 6 months Validity, the VAN HEUSEN E-gift card opens up a new world of possibility altogether - the Gift of Choice! 1. This e-gift card is redeemable only once, and needs to be used in full. No refunds / credit note shall be issued for unused part of the e-gift card. 2. 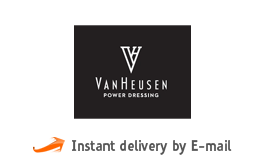 This e-gift card can be use Across all Van Heusen stores only. 3. This is an e-gift card. This card is not valid until activated at a participating Van Heusen store. 4. This e-gift card is solely for the use of purchasing merchandise at participating Van Heusen exclusive stores only. 5. Please present this card to the customer representative before billing. 6. This card has 6 months validity from the date of issue. 7. Protect the card numbers and PIN numbers to avoid misuse. In case the card number gets stolen, it cannot be replaced nor cash refunded.